It always fascinates me when one species just stays with the species. How do they do that? And why do some hybridize? they're beautiful! love their dramatic eye! What smart looking ducks these are Mick and what a shame they end up hybridising with Mallards. I like the way you kept both birds in good focus in that top shot. Great story and great photos. Boom & Gary of The Vermilon River, Canada. A new duck for me. A beauty. 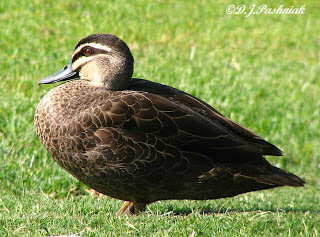 These are wonderful photos of great-looking ducks.! Interesting info too. Beautiful images and info. Many thanks for sharing. ITs a stunning looking bird--I LIKE it--wow imagine if all birds hybridized--we would be going nutz trying to ID all those new ones!! I see the similarity with the mallard. That eye line is way more pronounced on the Black duck. The feather pattern is beautifully complex. Your photography is splendid! 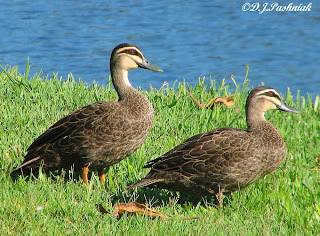 Great shots, they seem similiar to the Black ducks here in the US. Beautiful birds. Mallards are always trying to wreck the gene pool. I liek this one. Looks a lot like the mallard bit the coloring is more distinctive. They are so pretty- I love the look of their eyes! I just happened upon your great blog as I was researching for a project I'm working on. Amazing photos! I'm an artist based in Melbourne and am in the early stages of research/development for a video work looking at migratory birds and the birding community that supports them. I'm really interested in connecting with bird-minded people to find out more about what drives their passion and the role birds play in their lives. I'm going to be in Maryborough, where I grew up, over the next week (14-20 Apr) and was wondering if you might be interested in meeting at some point? I realise that this is a bit of an abrupt way to contact you but just thought it was worth a try! I'm really happy to give you anymore info about myself and the project if you'd like. Feel free to email me at pleasegiveproject(at)gmail.com. It would be great to hear from you. What beautiful pictures, Mick! A very handsome duck, much better looking than our black duck which hsve also hybridized with mallards. It looks like mallards are really promiscuous :-) But it's a pity because this will eventually eradicate the original species. Beautiful ducks! Love the 'eyeliner'. A very interesting post. I love seeing and learning more about birds in your country. Thanks for sharing! That sounds like a worthwhile project you have been invited to participate in. Let us know the outcome, will you? I am not a duck lover, but your images are brill. The previous post really got my fancy. I love those little ones, which I'll never get to see in real life.